Let's all stand up and do a happy dance because it is the weekend! Brrrr this week has been particularly chilly here in Chicago. How's the weather by you? 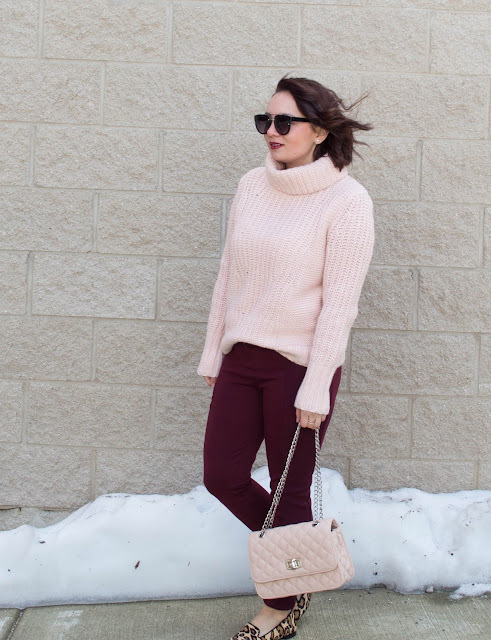 in warm turtlenecks and call it a day. get it in petite if you can. oversized turtlenecks fit you nicely! makes it that much more special. I had to have it! and it is beyond cozy and warm. So tell me have you taken the plunge on turtlenecks this season? This would actually be very cute for a casual dinner on Valentine's day. I love the colors on you! I was actually just going to say it'd be great for casual Valentine's day as well! 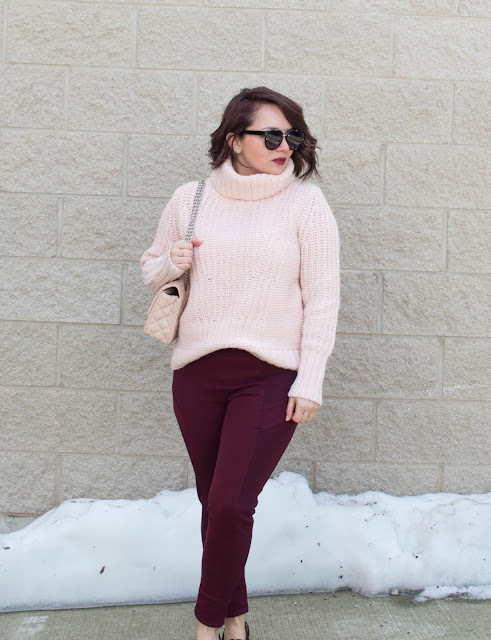 Those pants are rockin, I love a good colorful pant - it makes any outfit more fun! I'm still looking for a good turtleneck - searching for a more fitted black one. Any suggestions? Obsessing over this light pink color on you Jess!!! So pretty and so cute! I am in love with this look! Happy weekend! Love those colors together! I need a pair of those jeans! That's such a great color combo for Valentine's Day! Your pants are so great! I've been trying to find pair of jeans other than blue. I love the maroon color. I've pretty much been living in cardigans all winter long. I'm from Chicago as well! This outfit is super cute!! Love the darker pants paired with the leopard!! What a sweet outfit, Jessica! Wonderful outfit, i really like the sweater!! Love, love this color combo! I know how you feel!! 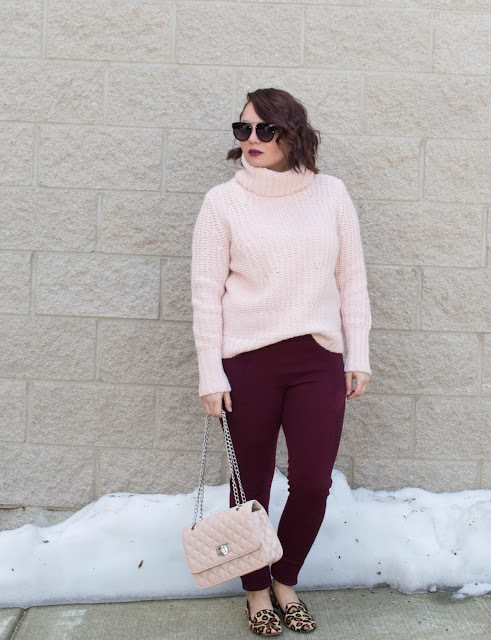 Finding the right way to do a turtleneck isn't obvious! But you did it nicely. And I love combining pink and a deep red like that - gorgeous and unique!! 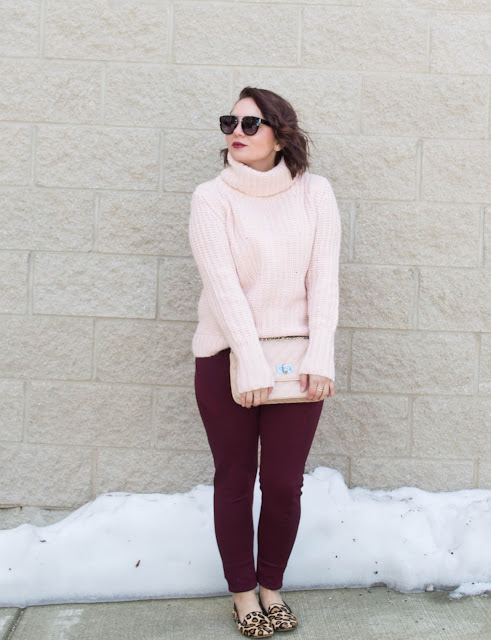 I love the mix of blush and burgundy here. Such a beautiful combination of colors.